Surprised? Well you should be. 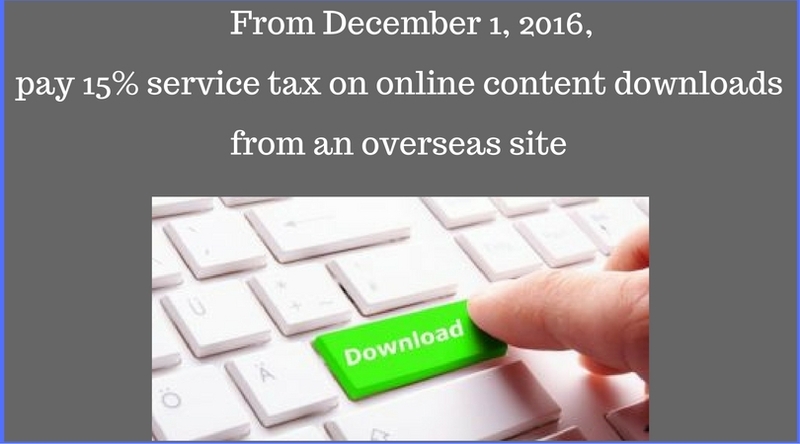 From December 1, 2016, you will need to spend more money while downloading movies, music, e-books, software and other digital content or paying for cloud hosting from an overseas website. This move has been brought through four separate but interlinked notifications dated November 9, 2016. The Central Board of Excise and Customs (CBEC) has amended the ‘Place of Provision of Services Rules’ (PPSR) for ‘online information and database access or retrieval services‘ (OIDAR). This is in addition to 6% equalization levy introduced from June 1 for B2B online advertisements of Rs 1 lakh or more in a year. What does that mean to you? If we go by the CBEC notification, say, in case you are among those who has purchased e-books from, for e.g. Amazon or movies/music from iTunes or say, you have purchased cloud services, for e.g. from Google drive or OneDrive, an additional 15 percent tax will be added to your bill. Same is applicable for online gaming as well as software purchases such as Adobe suite, Microsoft Office Suite and many more. Well the move seems to align with the service tax rules for online services with the draft place of supply provisions under the proposed goods and services tax (GST) regime, which is expected to be introduced on 1 April 2017. To understand what has changed and how the change has been effected, we need to discuss the scenario before effective date of amendment. For any service to be taxable, two factors are important to consider. Firstly, it should not be in negative list and secondly, it should be provided in taxable territory which is India except State of J&K. The place of provision of a service is determined as per rules set out in the PPS Rules. The default place of provision of service is location of the service recipient. 2. Cross border B2B (business to business) services are taxable under a reverse charge, i.e., the service recipient is liable to pay service tax. (As per Notification No. 30/2012-Service Tax (“Reverse Charge Notification”)). Now look what the law says about OIDAr services. OIDAR services were defined in Rule 2(l) of the PPSR as “providing data or information, retrievable or otherwise, to any person, in electronic form through a computer network”. Currently, domestic service providers are already incurring service tax on the OIDAR services. In view of Rule 9 of the PPS Rules, OIDAR services have been specified as an exception to the General Rule and are deemed to be provided at the location of the service provider which is not taxable territory. Hence, all cross-border OIDAR services provided to Indian residents, whether they are B2B or B2C services were exempt from service tax before December 1, 2016. How the things have changed now? The hitherto definition of OIDAR services given in PPSR, 2012 as mentioned above has been redefined vide Notification No 48/2016-ST dated 9.11.2016. Rule 2 of the Service Tax Rules, 1994 has been amended to include clause (ccd) in sub-rule 1 to insert new definition of OIDAR services. The new definition is very extensive and much wider in scope as compared to previous one. Note that using the internet, or some electronic means of communication, just to communicate or facilitate outcome of service does not always mean that a business is providing OIDAR services. Further Circular No 202/12/2016-Service Tax, has provided indicative list of OIDAR as well as non-OIDAR services. The crux of the amendment is the change in the definition of ‘place of provision of service’. Accordingly, cross-border OIDAR services provided in India shall be taxable. The exemption which is currently available to all cross-border B2C services provided in India has been removed for cross-border B2C OIDAR services vide Notification no. 47/2016-Service Tax dated 09-11-2016. Accordingly, cross border B2C OIDAR services provided in the taxable territory will be liable to service tax. Vide Notification No 48/2016 dated 9.11.2016 and Notification No. 49/2016 dated 9.11.2016, amendments in the Service Tax Rules, 1994 (“ST Rules”) and the Reverse Tax Notification have been made. Accordingly, cross-border OIDAR services provided in India are made taxable under a reverse charge in case of a B2B service, and a forward charge in case of a B2C service. Non assessee online recipient i.e. In addition to above, a deeming provision has been added to determine the location of service recipient. For any cross-border OIDAR service, the service recipient shall be deemed to be located in India if any two of the specified non-contradictory conditions are satisfied. These conditions relate to presence of certain factors in India including recipient’s address as presented by him via internet, issuance of his credit card debit card etc., his billing address, internet protocol address of device used by him, etc. For instance, if you use a credit card issued in India to settle the payment for service and also your billing address is in India, you shall be deemed to service recipient located in India. Further, service recipient in the taxable territory shall be deemed to be non-assesse online recipient if such person does not have a service tax registration in the taxable territory. A deeming provision has been inserted Service Tax Rules in Rule 2 (1) (d) (ii) for an overseas intermediary for liability to collect and discharge tax. An overseas intermediary shall be deemed to be receiving OIDAR services from overseas service provider and providing such services to service recipient. The intermediary includes an electronic platform, a broker, an agent or any other person, by whatever name called, who arranges or facilitates provision of such service but does not provides the main service on his account. The provision shall apply only when such intermediary satisfies all the prescribed conditions. Intermediary authorizes delivery of services. Illustrations where an intermediary shall be deemed to be a service provider of OIDAR services are given in the Circular. However, it may be noted that payment companies, internet providers or mobile operators not involved in delivery of services should not be covered under this service. To determine the compliance requirement, it is important to understand who is liable to pay tax? Here we should note that among all, the compliance for overseas service provider is new and definitely calls for a proper identification and review mechanism. The Service Tax Rules have been amended by Notifications to prescribe online registration procedure and invoicing details for such persons while simultaneously introducing new Forms or amending the existing Forms to take care of the above change. The overseas service provider may appoint an agent in the taxable territory who will be person liable for paying service tax. For B2B category, impact is minimal. Import of OIDR services would entail payment of service tax on reverse charge basis as well as service tax paid may be reasonably available as credit. This category will have the largest impact. Service providers who are not located in India would be required to pay service tax in India thereby additional compliance formalities. The overall impact of this service will be an increase in the charges for the end-user who downloads these services, as the overseas service provider is likely to collect the cost from the consumer. Hope you find the article useful. Post in your comments, if any. A company registered in India engaged in business of development & supply of content i.e development of mobile value added services e.g caller tune, ring tone, music etc..and supplying it to youtube having their sever in ireland, will it be chargeable to service tax or it will comes under export of services & rule 3 of pops rule 2012 apply, hence exempt from service tax. please be note that development & supply of content is a separate category to be registered with the deptt.